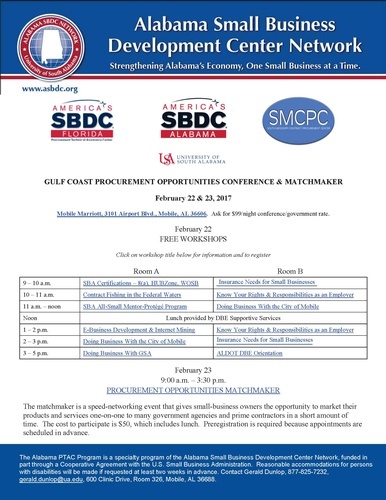 This year’s Gulf Coast Procurement Opportunities Conference & Matchmaker Feb. 22 and 23 is shaping up to be a great one. We have a fantastic list of government agencies and prime contractors lined up, and we’ve added several new workshops in addition to some standards that are always popular. The event will again be held at the Mobile Marriott, 3101 Airport Blvd., and registration is now open. The event is for small businesses interested in doing work with government agencies or prime contractors. There is no charge to attend the workshops, which are open to anyone interested in pursuing work with the government. The workshops will be Wednesday and will cover basic information as well as specialized topics for more advanced attendees. For a list of workshops and to register, go to the portal page. Lunch will be provided by DBE (Disadvantaged Business Enterprise) Supportive Services. The matchmaker on Thursday is for established small businesses with a successful history in commercial work or previous government work. It is a speed-networking opportunity that gives small business owners and representatives the chance to market their products and services one-on-one to many government agencies and prime contractors in a short amount of time. The cost to participate is $50, which includes lunch. Preregistration is required because appointments are scheduled in advance. Participants should prepare a short “elevator speech” about their company and bring a capabilities statement as well as other marketing material. For information on the matchmaker, click http://asbdc.ecenterdirect.com/events/7732. Be sure also to follow the links to the UA payment form and the form to indicate which buyers you would most like to schedule a meeting with. The two-day event is a combined effort by the Alabama SBDC Network’s PTAC Program, the Florida SBDC’s Procurement Technical Assistance Center, and the South Mississippi Contract Procurement Center. Additional support is provided by DBE Supportive Services, SBA Alabama District Office, Mobile Area Chamber of Commerce, and the Alabama Department of Revenue.